Everywhere you turn, new products for new Wranglers. But what about those of us still driving (clutching to) our older Wranglers? Where’s the love?! 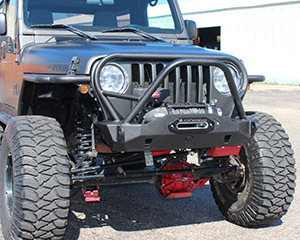 JcrOffroad is proud to announce our new front bumper line for CJ, YJ, TJ, and LJ’s. Just in time for fall wheeling! The Crusader – Mid-width bumper, LED light mounts, Hi-Lift jacking points, integrated winch fairlead mount. 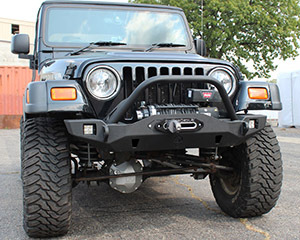 The Dagger – Stubby width bumper, slim design, tall pre-runner hoop, included bolt-on fairlead mount for sleek appearance with or without a winch. 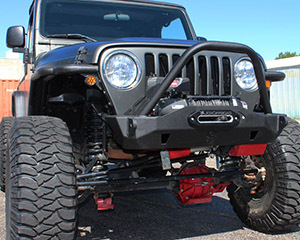 The Mauler – Stubby bumper, Hi-Lift jacking points, tall pre-runner hoop, integrated winch fairlead mount. The Mauler Deluxe (TJ/LJ only) – Stubby width bumper, Hi-Lift jacking points, tall pre-runner hoop w/radiator hoop, integrated winch fairlead mount. The Vanguard – Full-width bumper, LED light mounts, Hi-Lift jacking points, integrated winch fairlead mount. 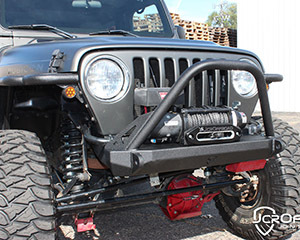 With these new wrangler bumpers we were hoping to bring some modern design to older Jeeps. So how did we do? Reply to this post, message us on Facebook, or call us (269-353-1184) to let us know.